I know I'm late to the party but I just found out that Cynthia over at Quilting is More Fun than Housework is hosting an adoption party for people to offer up unfinished projects. When I first started quilting, I didn't have any sort of stash, so a friend of mine who was a quilter gave me some of her scraps to sew. I started sewing up random strip blocks and trimming them up to 5.5" square with the intention of alternating them with some hourglass blocks to make a small quilt. There are 26 blocks to be given to a new home. I'll pay shipping anywhere in the US. Be sure to check out some of the other projects that are being offered up on Cynthia's site here. Congrats to #12 - Mary Burnette! I'll be contacting you via email so that I can ship the blocks off to you! Hello Diana I would love to have these blocks. 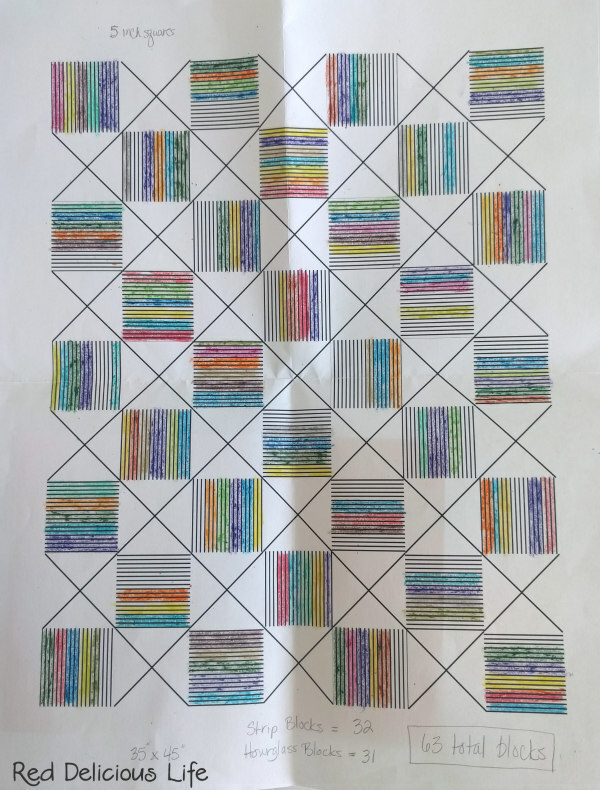 I have been making some blocks kinda like these with strips left over from my fabrics so these would go nicely with what I have made. Thank you for the chance. Thanks for participating in the event. I have this same quilt saved to make some day. Looks like you will find them a home! 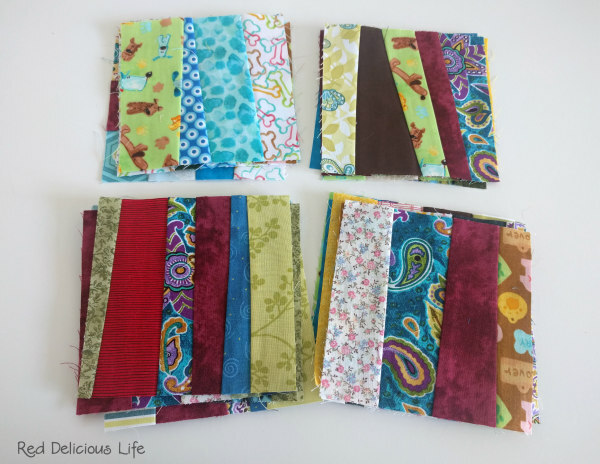 Strip quilts are a favorite of mine, so I'd love the chance to give these new life! Thanks! 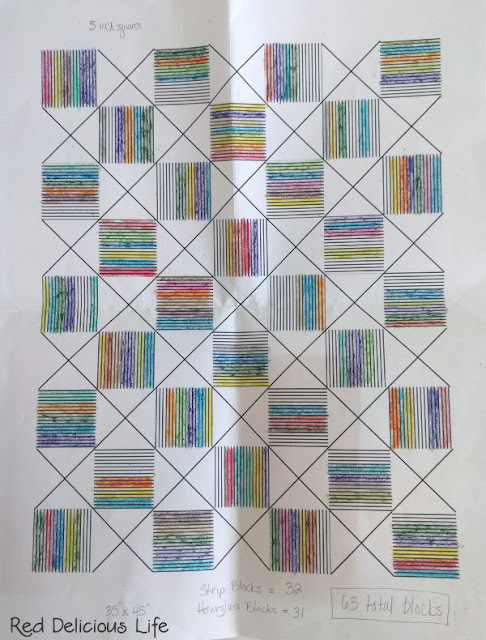 These would be perfect for a charity quilt project that my girlfriend runs called Mito Quilts of Hope mitoquiltsofhope.org It is for giving quilts to children and adults affected by mitochondrial disease, which is a neurodegenerative disease that can be life threatening. Please FB message "Lisa Mito" if anyone would like to help out or donate a orphaned quilt or use the contact on mitoquiltsofhope.org. 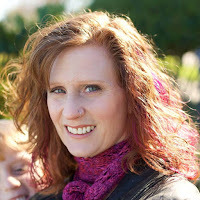 Hi Diana, I am a red head quilter also! I would love a chance for the adoption, I love the pattern that you were planning! I'm so glad you got some orphan blocks up for adoption! It's so great to see them going to a new home and get a new life! fabric choices are the hardest thing for me. It is the hurdle in the race that I can't get over easily. I love to get blocks from others where their creativity has already made the hard choices. I make quilts to raise money for our school and the community with blocks given to me. I love working with other's works-- it takes the pressure off :) I would happily take your blocks and create something fabulous with them that would support other's fundraising goals. Pick me! :) p.s. thank you for offering them up in the first place. I would finish these and donate them to our Women's Shelter. That's our Guild charity of choice. Love the work they do. ME! ME! ME! ME!! I love orphan blocks! I would love to make use of these blocks. I have something similar going with my scraps, but put them away only because of the repetition of fabrics. I needed to add to my scrap pile before I could make more. This would be the perfect way to get that project done.